The Sheraton Hongkou was the 3rd hotel I stayed in Shanghai and was the only one located at the other end of the city in Puxi. 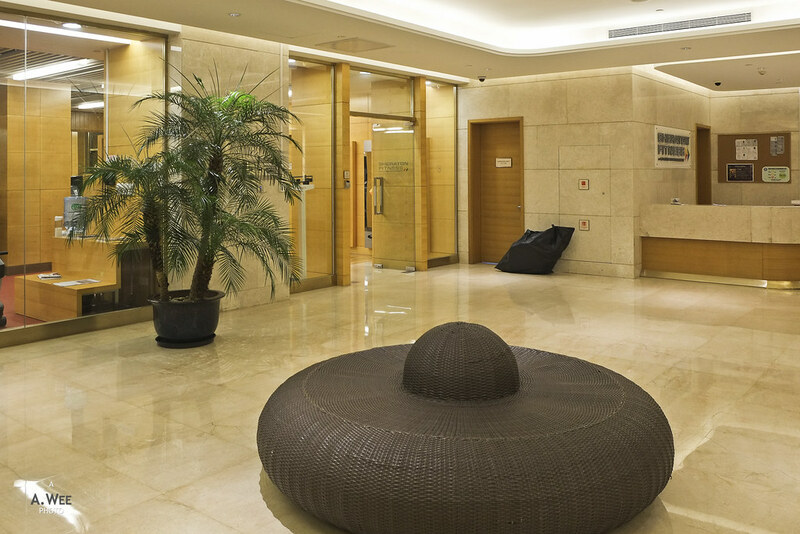 Specifically the hotel is located in a residential neighbourhood of Hongkou district. After finishing with my business in Puxi in the evening, I collected my luggage which I had deposited with the hotel and took another Uber ride to this hotel. This was one of the longer rides since it crossed one of the tunnels under the river. Located within an office complex, there are several construction going on around the area, but it is located next to the Hailun Road subway station which is an interchange for Line 4 and 10 of the Shanghai Metro. 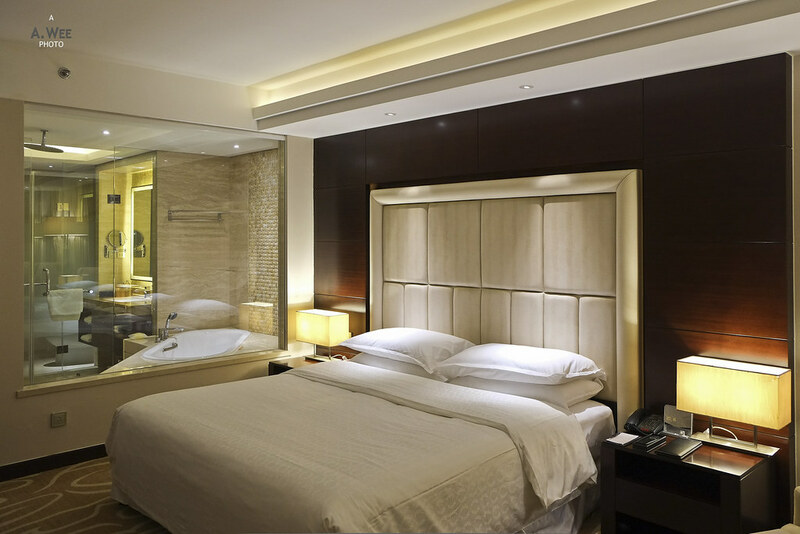 That makes this property a convenient location to get to the Nanjing Road Pedestrian Mall, since it is only a few stops by the metro. 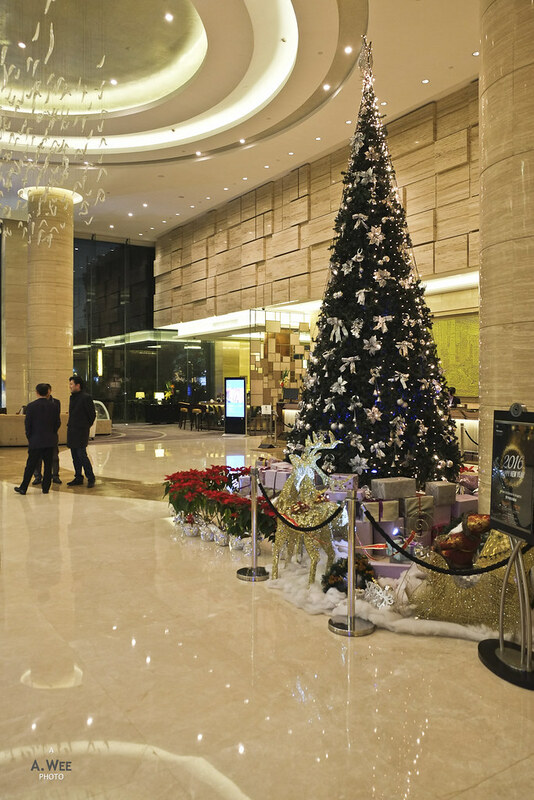 Since it was around Christmas time that I visited the property, there was still the tree in the lobby just like the other SPG properties I visited in China. Checking in was pretty quick and I noticed there was some sort of tour group that was checked into this hotel as well. 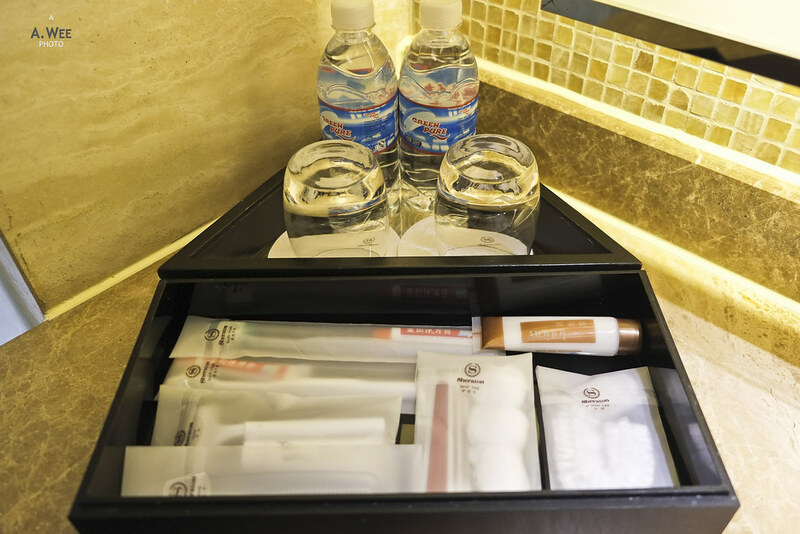 Selecting this hotel to stay in for my last night was pretty simple as it was one of the newest SPG properties in Shanghai and it was located in Hongkou which I figured was closer for getting to Hongqiao Airport where my flight departs the next morning. There was no mention of upgrade when I checked in, and I was asked again what I preferred for my Gold amenity. Just another quick check-in and I was given my room key. 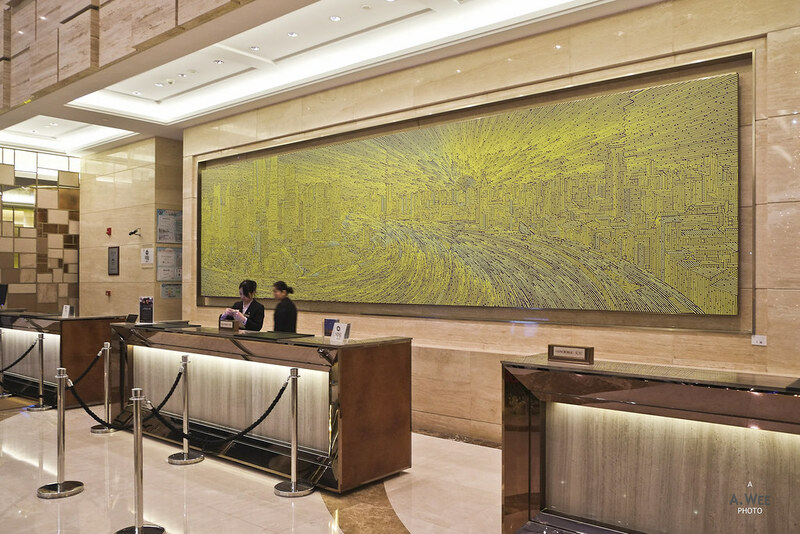 I did notice the nice painting of Shanghai’s skyline behind the reception desk though. Entering the room here feels more like being in a traditional hotel room. Though there was some sort of ornament beside the door on entry. Beside the ornament was the entry to another spacious bathroom. A large vanity counter forms the centre of the bathroom while the right side of the vanity was a huge shower area. A bathtub was inside this area that was separated by a glass door. 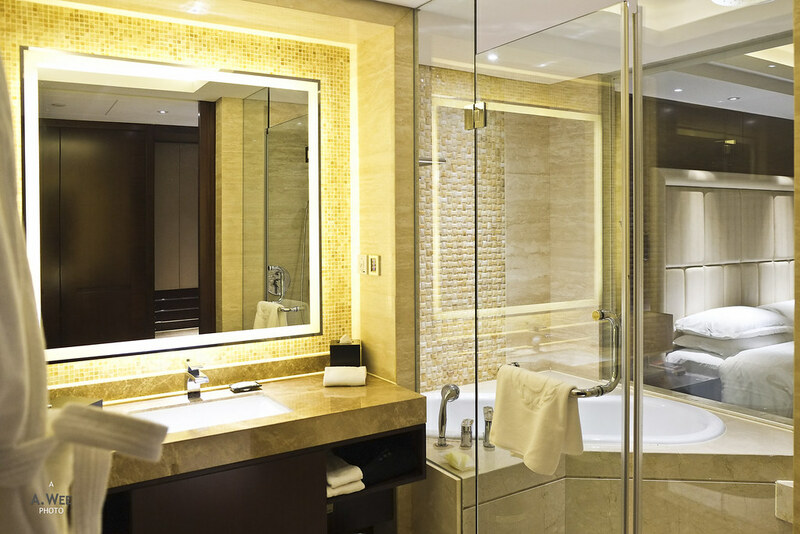 And like many newly-built hotel rooms, the bathroom has a glass window overlooking the bedroom, though they had a remote control that could lower the blinds to make it private. I find the bathrooms with glass windows in China tends to be well equipped with blinds and that makes it nice and practical at the same time. The other side of the bathroom is a closed section for the toilet with hangers for the bathrobes. To make it private, there was a frosted glass segment on the glass doors. 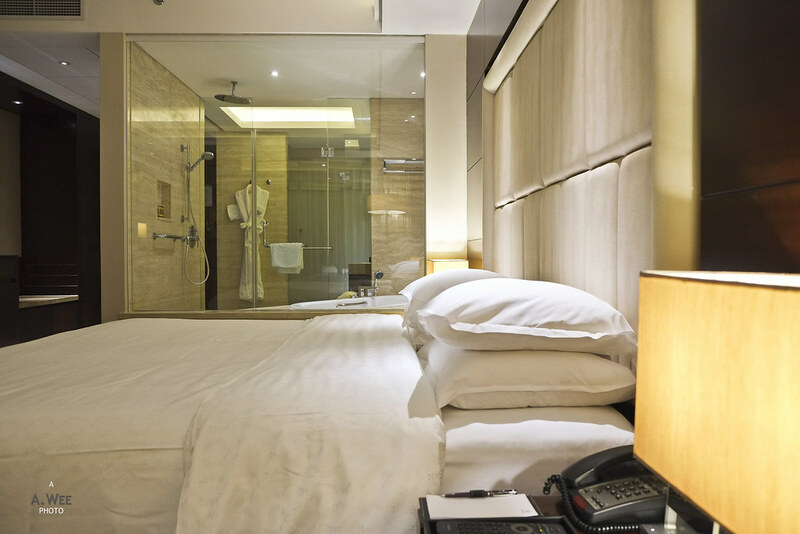 Privacy seems to be more well thought out in designing hotel rooms in China. 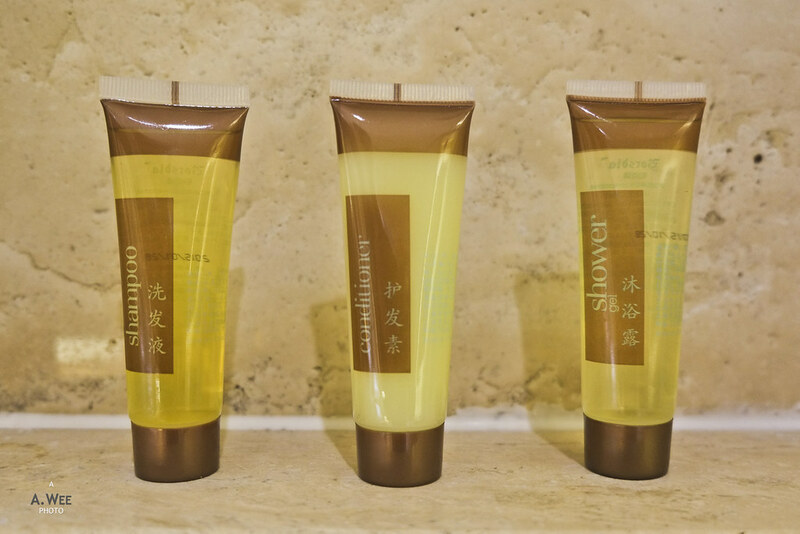 Bath amenities were the usual Sheraton brand that features the Mandarin and Mint scent. Standard offering that is acceptable but nothing to shout about. There was a complete set of amenities in the bathroom though so it was well furnished. While the space was conventional, the rest of the bedroom was still very spacious. 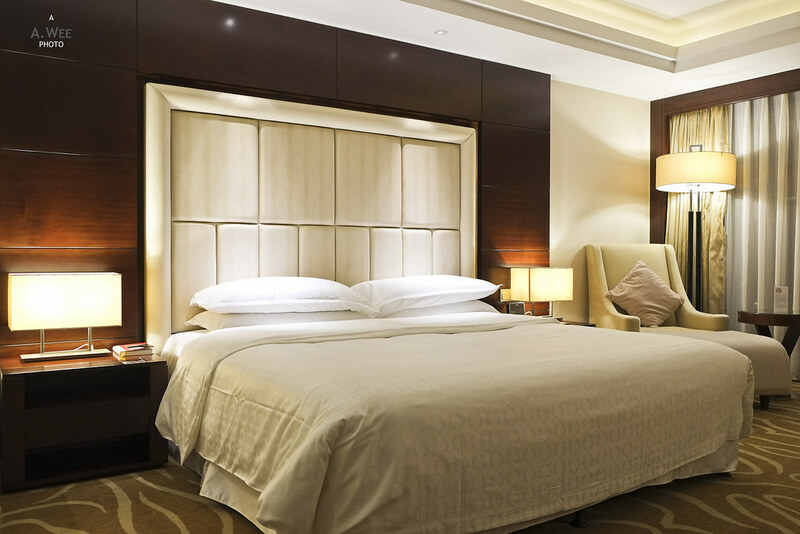 There is a comfortable King bed in the middle with soft headboards. That makes it nice to recline on the bed while doing some reading before sleeping. 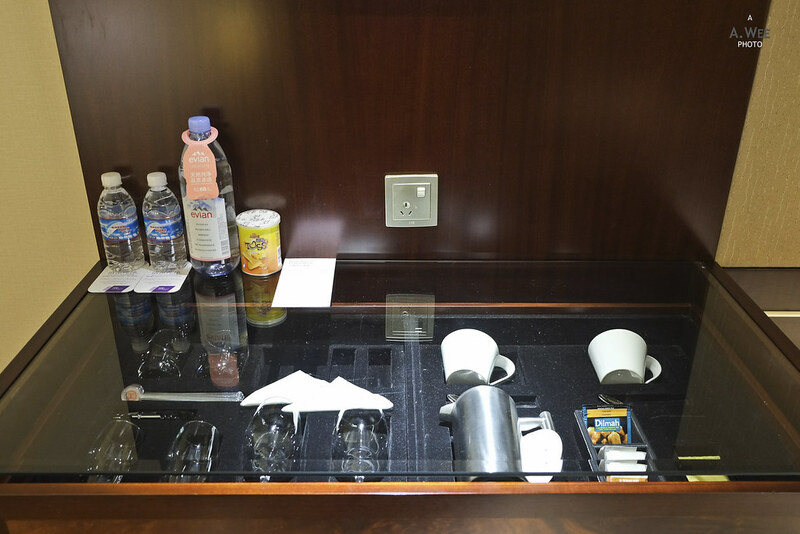 On the side of the beds, there are 2 large side tables, making it easy to place glasses for drinking, your mobile phones and also magazines without running out of space. While this room also features a nice view of the city skyline of Shanghai, it was already late at night when I arrived and I did not take a photo of it. However, they did place a plush armchair with an ottoman by the window to enjoy the view when it is available. The next morning it was foggy and there was poor visibility so the view was useless as well. Across from the bed, there was a good-sized flatscreen TV with a glass work desk. Similar to the other rooms that I stayed in, the desk faces the room door, and that makes it easy to notice people coming into the room. There are also luggage racks and a minibar in the room beside the wardrobe in the entrance foyer. While the room does have enough bottled water for guests, there was no fruit platter given here. Perhaps it was because of my late check-in or maybe there just wasn’t any note for the room service people. But it just stood out since I did get a welcome note and fruit plate in my other stays, so this one point stood out. 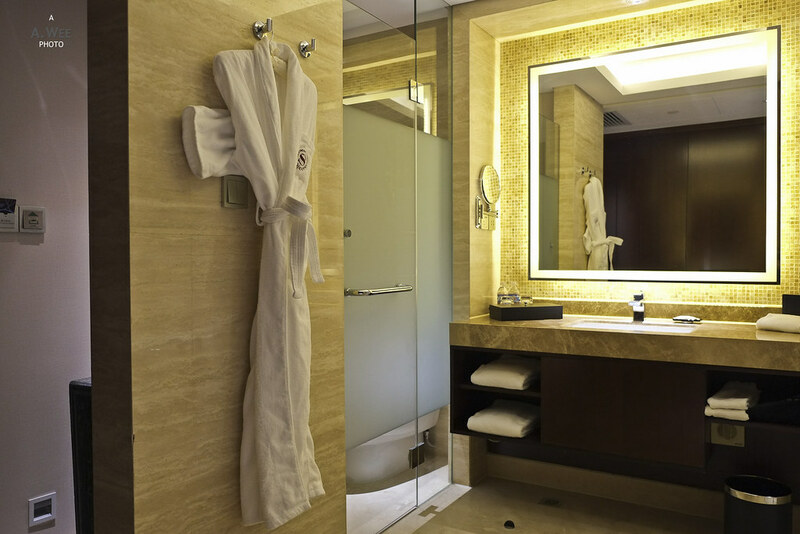 Comparing the facilities, the Sheraton Hongkou is fresh and new, and it feels that way with the contemporary furnishings. 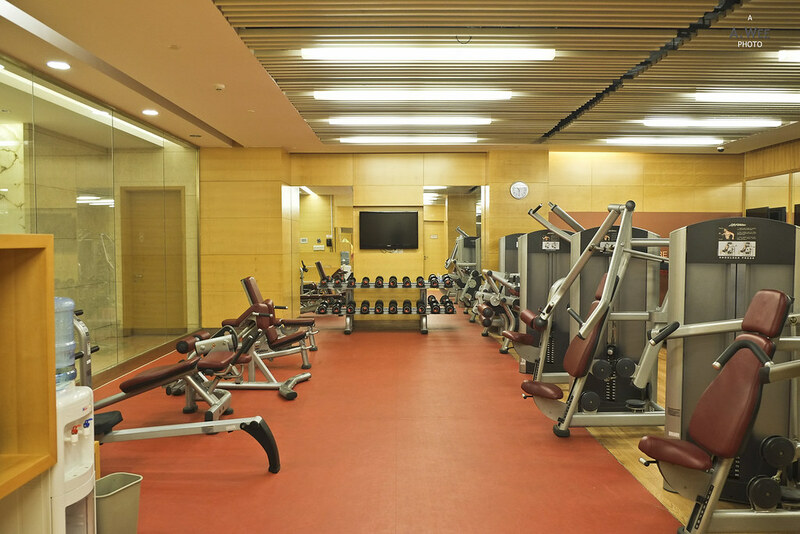 There is a very nice fitness centre here with a glass wall that overlooks the corridor. 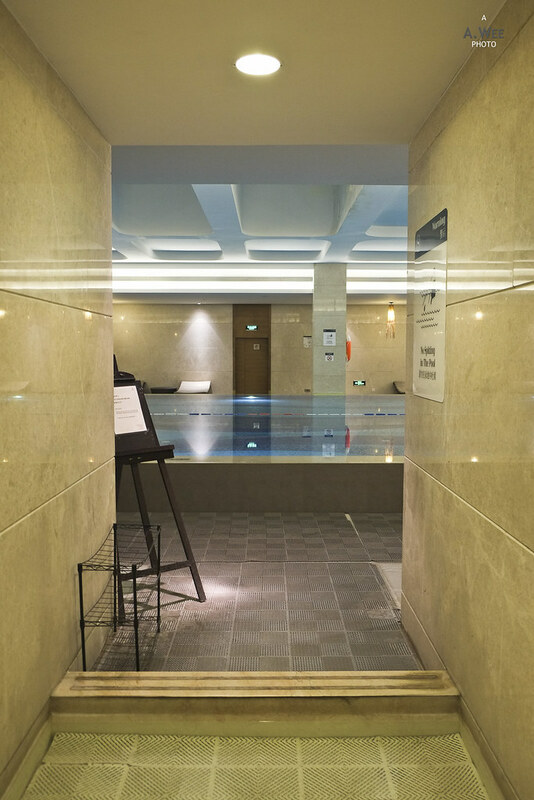 There is also a spa and swimming pool area though a small walkway that is filled with water separates the locker and changing area from the indoor pool itself. This was built to prevent guests from walking into the swimming pool area with their shoes or slippers. It is also meant to rinse the legs before entering the pool area. It was just the first time I encountered such a design though. Check-out from the hotel was also quick in the morning as the lobby was still quite empty since I had to catch a morning flight to Tokyo from Hongqiao Airport. With the late arrival and early departure I did not really make use of the hotel’s facilities or services. Though I do believe there was turndown service in this hotel, just that they do not provide any amenities like chocolates. Amongst the hotels I stayed in Shanghai, the Sheraton Hongkou was somewhere in the middle with a rate of CNY700 (~$120) per night. While the location on the other side of the river is better for tourists, there is not much around the vicinity for grabbing a bite or night activities. Thus I am not sure if this is a great location. 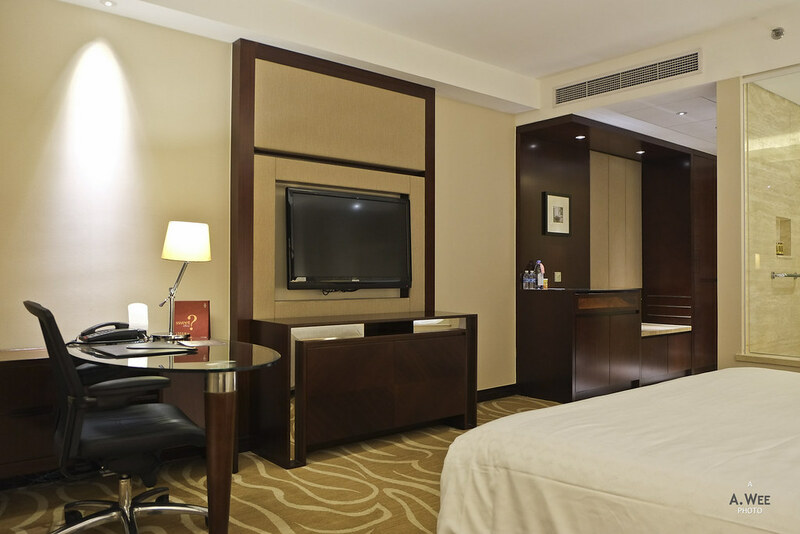 While the cost is not expensive, I actually prefer the hotels in Pudong, due to the vicinity to malls and eateries. Wow! Great pictures! Thanks for reviewing this hotel.